Washer Switch | THERMO Spoken Here! When a washing machine is started, a valve opens and to allow water to fill the washing tub. Rising slowly, the water level eventually closes the bottom of the water shut-off mechanism. An approximation of the mechanism, a tube open at the bottom and closed at the top by a spring-type bellows is shown. As the water level rises, air trapped in the shut-off tube is compressed, its pressure (acting over the inside area of the bellows), extends the bellows slowly upward until a switch is thrown setting the water supply valve to its "off" position. Calculate the "shut-off" depth of water in the washer. ♦ The sketches show the "initial" and intended "final" condition of the switch that controls water flow to the tub. Sufficient properties and dimensions are provided to determine the final depth of the water, H, when the machine switch indicates the washer is "full." The event involves rising water, trapped air, and extension of the spring bellows. However, this problem can be solved simply by consideration of the mechanical equilibrium of the bellows in its second state. The system will be the bellows shown in its "free body diagram." The momentum of the bellows equals zero. The pressure-forces are pressures times areas. The spring force is its constant times its extension and the gravity force on the bellows is negligibly small. 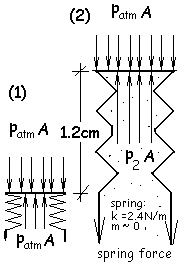 The extension of the spring is 1.2 centimeters. In the above equation, only pair,2 is unknown. Another equation is available. It relates the depths of the water and air pressures. In the above equation, H and h are unknown. But the fact that the mass of the air in the tube is constant provides another equation. This last relationship has p2 and h as unknowns but they have already been counted. There are three equations and three unknowns. These solve. H = 37.3 cm.